Stepping into our fifth year as a festival, Titwrench 2013 continues in the spirit for which it first began back in 2009: A multi-day exploration of music, art and performance with an emphasis on all ages, inclusive environment for artists and audience to come together. 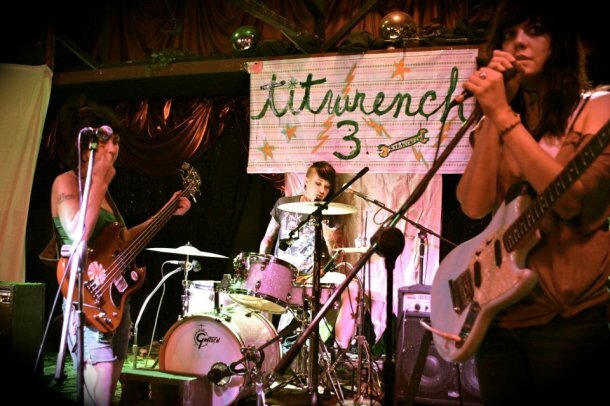 As a completely DIY fest, Titwrench aims to highlight female and female-identified performers pushing the boundaries of genre and form, while bringing the surrounding community into the fold with interactive workshops and productions. Generally a participant in the onslaught of summer festivals, this year, we’ve brought the fest into the fall, with the 2013 edition going down this September 5th, 6th, and 7th. In our five year existence, Titwrench has called many great venues across the city home. For 2013, we will be taking over Glob for all three days once again. A well-known DIY spot at 3551 Brighton Boulevard in the burgeoning River North Art District, Glob has hosted shows like No Age, Monotonix, The Pirate Signal, Japanther, and dozens more in its almost-decade of existence. It has also been a launch pad for Titwrench, by being the home of our pre-fest dance parties, a fundraising platform integral to raising the money needed to put on a DIY festival of this size and scope. For this 2013 edition of Titwrench, we are stoked to present a strong line-up of local and national musicians, performance artists, poets, visual artists and DJs. From electronic virtuosos to MCs and modern dancers, Titwrench welcomes outsiders in, creating a community built on empowered people. I'm a writer, reporter and musician based out of Denver. I'm a regular contributor to Westword and Alt Press, and have written for the likes of XOJane, The Onion's A.V. Club, and The Denver Post's Reverb. I'm also the co-organizer of Titwrench, an all ages, all-inclusive multi-day music and art festival celebrating its fifth year in Denver in 2013.